Note: Due to the varied capabilities of internet-enabled devices, all features of m.DART.org may not be available on all devices. Why doesn't this work for my bus? Select only one route from a drop-down menu. Scroll to the bottom of the page and click "Submit." An alternative form is available below the "Submit" button for both route selection and stop selection. » The first line shows the header sign information to be found on the front of the bus. The number in [brackets] is the bus block number. » The second line shows the arrival time. Scheduled time will be shown up to 20 minutes before the scheduled arrival time, then estimated time will be shown. 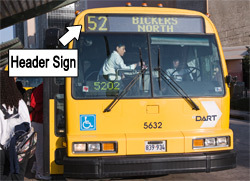 When bus is estimated to be within 5 minutes of arrival, display becomes: Arriving Soon (from estimate of 5 to 2 minutes prior to arrival) and Arrival Imminent (from estimate of 2 minutes to arrival). » The Last Reported Location is the actual location of the bus for the time reported. Last reported location and the path to the selected stop is shown with a map below. No map will be shown if real time data is not available. The map will show the location of the bus(yellow pin with bus icon) in relation to the stop(red X). The blue line will show the route the bus will take to arrive at your stop. To update the page - click refresh on your browser. » An option is available to see the next three or the next six additional buses. Look for To view the next three buses, click here. and To view the next six buses, click here. below the map. The next buses for the route and direction selected will be shown. Use the pins (A, B, C, etc.) to distinguish between the different buses on the map. The third bus (A) in the example map above is the same equipment that is currently operating the next bus (A) on the route. » The Point-to-Point trip feature can be accessed from this screen to show trips between your selected stop and your destination stop on the selected route. » If other service is available at a stop, there will be a drop-down menu available to select another route and see its estimated time of arrival. » In some cases, real-time data may not be available. The scheduled time for the bus will be displayed instead of the estimated time. » Please note: Schedules shown are estimated and subject to change. Traffic conditions or bad weather can affect posted times. Please arrive 5 minutes before times listed. » If you frequently use a route and stop, bookmark the results page in your browser to conveniently view the next arrival time anytime you need the information. When you pull it up again using the bookmark, it will refresh to the current information. If you ride a certain route and board at a specific stop regularly, you can not only bookmark the final result page but you can even add the link to the Home Screen of your iPhone. Click on the plus (+) sign at the bottom of your browser window and select "Add to Home Screen". This will add an icon to your iPhone of the DART logo and the next time you pull it up will have the current information about your route. If you regularly ride more than one route, give each icon a unique name, but keep it short. "To Home" or "To Work" work well. » Due to varying route operations, results may differ according to the time and day of the week. © 2019 DART. All rights reserved. Location data provided by geonames.org.